Queensland promotes itself as being 'Beautiful one day, Perfect the next'. But, while we'd been struggling with the cold and ever changing weather of Victoria, south-east Queensland had been suffering a heatwave (hardly beautiful or perfect). It was time for us to get back (as promises had been made) and H was looking forward to the heat, but I wasn't. First stop was Echuca on the NSW - Victoria border. There we explored the historic Paddlesteamers by taking a trip on one and visiting the museum (which came with a tour). We're glad we did both but the museum and tour, we thought, were most interesting. A couple of days later we stopped overnight at a place called 'Burning Mountain', just North of Scone (where we did eat scones). In the morning we did the Burning mountain hike and we're most impressed by the coal-seam gas fuelled fire that has been burning for an estimated 6000 years. Back in Queensland the weather has changed and it's been pleasant ever since we got here. In fact, i think it's been beautiful one day and perfect the next! 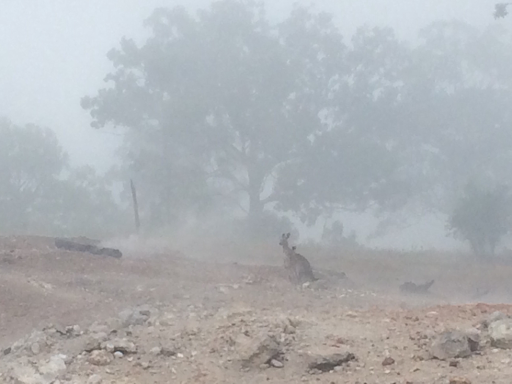 Here's a picture of the Roos in the haze on Burning Mountain.